Those who I put this question to often look at me like I am trying to trick them, and there is relief when I hint that they can give more than one answer. For most of us the best place to do our work will depend on what we need to be productive in at the time. Considering how much time and importance we allocate to our jobs it’s surprising how novel the question is. And considering how much money employers invest in salaries and office accommodation, and more importantly management’s commitment to shareholders around value growth, it’s perplexing how little thought is allocated to this key consideration. So if we know most the workplace should accommodate a range of work-style zones to support optimal productivity then why then is most workplace design so rigid? Four-person deep, double sided rows of open plan desks with insufficient numbers of central meeting rooms is the norm for recent fit outs. But for the two feet shaved off the partition wall they are cubical farms. Designers tout that it will make the workplace dynamic, flexible and productive. 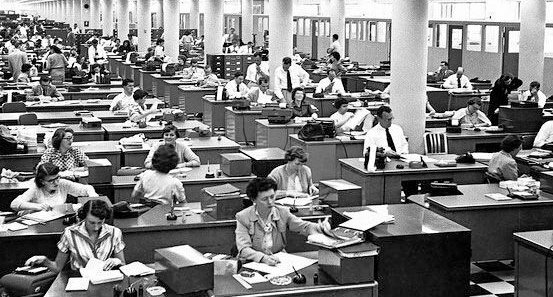 Yet most contemporary office fit-outs are efficiency-led, designed by or for those with ill-conceived understanding of staff engagement and productivity. Many Activity Based Work set ups are not much better – but there is more to say on this another day. Take a moment to ask yourself – what immediate work environment might be most productive to get through your emails, find out whats really going on in the office, read a draft contract, establish rapport with colleagues in other departments or resolve a challenging negotiation over the phone. Does your employer or building owner give you the right spaces you need to excel? Few businesses can outperform through efficiency-led initiatives. Successful businesses are driven by increasing productivity and engagement, by attracting and retaining great staff. So why is there such an extreme emphasis on efficiency over productivity in workplace design? I predict that in the next 18 months workplace accommodation investment decisions will shift from capturing efficiency gains to a greater emphasis on engagement and productivity gains. The shift will start with high profile tech companies. There will be a scramble to understand the growing body of quality research in this area and there will be a shortage of capable and engaging workplace design strategists and placemakers. Have you experienced a workplace that achieves the right balance of efficiency, engagement and productivity? I’d love to get your nominations. Clive Dale is a consultant to landlords and large occupiers. He does some of his best thinking when walking alone by Sydney Harbour.